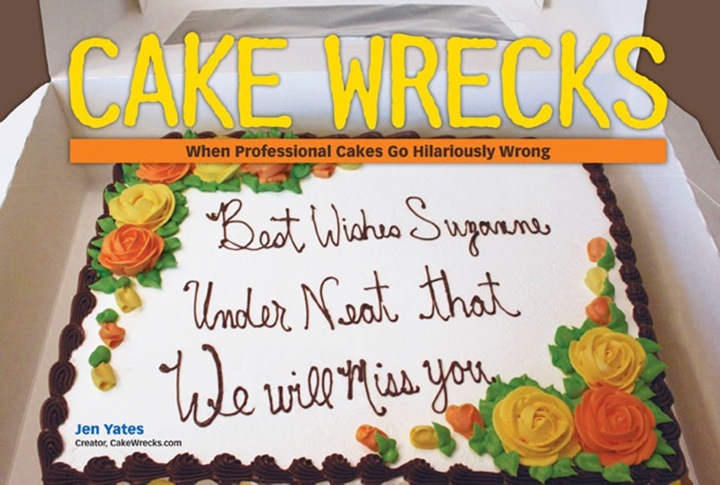 Cake Wrecks - Home - Ha! Fooled You AGAIN! By CW reader Brenda S.
It's a literal beef cake! By CW reader Barbara G.
Sonya D. here even did both: The "cake" is meatloaf with mashed potato icing, and the grilled cheese "sandwiches" are cake! Cute! Now ... SOMEONE BRING ME A CAKE SAMMICH. Naturally, all the big chain bakeries have decided to get in on this action, churning out a veritable plethora of faux food guaranteed to fool ANYONE who is standing fifty feet away and just got those pupil-dilating drops put in from the ophthalmologist within the past hour. I think it's supposed to be a hot dog and fries. I KNOW it looks like moldy doody. How about single servings of spaghetti and meatballs, macaroni and cheese, and tiny cherry pies? Although I don't remember the Bog of Eternal Stench having quite that much silly string. Much as it pains me to admit it, sometimes the "corn on the cob" cupcakes can be pretty darn cute. Happily, this isn't one of those times. Let's not ask what the lumps are in the other cupcake's icing, though, ok? I'd like to eat again someday. Thanks to Shellis S., Mia & Trinh, Kris D., Tracy W., Sabrina P., Kae B., & Sheila M. for the faux food foolishness. The wreckerator versions do leave something to be desired. 1) This is a hot dog? Can't be. Everyone knows you don't put ketchup on a hot dog. Looks to me more like a raised bed garden. Though what they're growing in it is beyond me. 2) Spaghetti and meatball? Looks more like a bloody stool sample, or a popped blackhead. And mac and cheese? Must have been the boxed kind to look that unappetizing. And I love the "hashtag, I'm not really a cherry pie". 3) I'm sure they were going for pizza here, (well, we can pretend, anyway), but what's with the green worms and the poo-poo swirls? I guess a bunch of seven year old boys would find this fantastic. 4) Call the dentist. Someone is missing their teeth. 5) That's not a cupcake. It's one of those scrubbing bubbles. 6) I'm still trying to figure this one out. Is that an alien saying, "Take me to your leader, but I must stop and smell the flower first", or is it Frankenstein's monster about to go on a rampage? (You know how he always had his arms sticking straight out). There are so many things to say, but...I'm kinda tempted to try potato chips with chocolate frosting now. Salty, sweet, fatty, and crunchy? Yes, please! Raisins? Walnuts? Chocolate chips? Ball bearings? The cupcake with the raw green beans. I suppose it is one way to get kids to eat their vegetables. Personally, I'm no less disgusted by the convincing fakes. I don't want to fix my face for one food and then get a completely different one. I'm sure that's just coconut icing on the last one... they wouldn't *really* put onion dip on it, would they?? The corn on the cob cupcakes look like baby teeth. Cake sammich, you say? I have made them, very easy. You get the silicone cake pan that is shaped like a slice of bread. Bake angel food cake in it. Slice in half, then flip the two pieces so the inside white part is now outside. Filling between the pieces is peach or pineapple cubes in whipped cream: "chicken salad." So glad I avoid going out on this day. I don't think I want to know if they make fake buffalo wings that would just make me so sad lol. I would probably be the unlucky one to get em too. The one with the 'cake' and 'sandwiches' would make me so sad. I love grilled cheese, I love carrot cake, this sort of deception would not stand. April 3, 2019 | Bec M.
Not gonna lie, I'm... tempted by the concept of a meatloaf cake covered in mashed potatoes. Imagine cutting it and finding half-melted cheese inside... Yum.